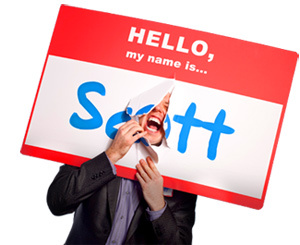 How to be Less of Putzbag in a Group Meeting - HELLO, my name is Scott! There’s nothing more annoying than someone who has all the answers. Especially in a group setting. I met a guy like this last year. Spent the whole day with him. Dude drove me up the wall. In fact, based on the body language of the other eleven group members, I think he drove them up the wall too. Hell, we should’ve just had the meeting on the wall. What can I say? I’m a writer. Piss me off and I’ll get you back on the page where you can’t defend yourself. 1. Be right less. Just stop. Seriously. Have some self-control. Even if you KNOW you’re right. Stop. Let someone else be right for a while. Not being right all the time doesn’t mean you’re wrong – it just means you practice restraint. Turn it into a game. See how long you can hold it in. Start with five minutes. I bet you can do it. And I bet you’ll discover that the comment you intended to share was actually incorrect, irrelevant or non-contributory. Remember: Don’t break the silence unless you plan to improve it. Do you have an arrogance of being right that clouds your priorities? 2. Practice a 5:1 question/answer ratio. Talk as much as you want. But for every comment, statement or observation you make, ask five questions. This holds you accountable to an exploratory attitude of curiosity and vulnerability. Plus it opens up the discussion, toggles people’s brains and engages their thinking. What’s more, 5:1 makes you sound smarter (in a roundabout way) simply because of your willingness to be dumb. Nobody ever left a group meeting saying, “Man, remember that guy who asked all those great questions? What an idiot. Sure annoyed the hell out of me!” Are you a great asker? 3. Allow ideas and experiences to profoundly penetrate you. Let the pearl sink. Register the moment. Allow the idea to slowly sink from your head down into your heart. Now, this practice of creative, patient listening is difficult for many people. It takes a tremendous amount of self-control. Keep in mind: The quicker you understand something, the more likely it is to be a superficial understanding of that thing. Think of it this way: Instead of taking two hundred pictures of the Grand Canyon, why not just sit on the edge of it, take two hundred deep breaths and just experience it? Remember: Pictures fade – memories of how you FELT last forever. Do you experience with your head or your heart? 4. Ask yourself WHY you’re listening. To receive people? To honor their truth? To create a loving space where others feel comfortable sharing? Or, are you listening to fix? To one-up? To insert your clever little jokes? To use other people’s comments as backboards against which you can try out your snappy new material, or to relive standup routines from fourteen years ago that probably weren’t funny in the first place? Remember: Listening isn’t a performance. Ask WHY you’re listening. Most people haven’t thought about this. Have you? That’s what good leaders do: They make other feel essential. And sometimes all people need is permission. Well, that AND someone to shut up the one guy who monopolizes the whole bloody discussion. Whom could you put into the spotlight?? 6. Stop going first. Your hand doesn’t have to shoot up like the teacher just asked the class, “OK, children: For a BIG piece of chocolate, who can answer this next question…?” Play the game called, Let’s See How Long I Can Go without Raising My Hand. Oftentimes, someone else will touch upon what you had originally planned to say, rendering your comment unnecessary. Better yet, you might gain a completely new dimension to your idea that you wouldn’t have known otherwise, thus making your ultimate answer stronger. How much insight are you robbing the group of by being impatient? 7. Slaughter your yabbits. You know what a yabbit is, right? One of those little, white fluffy creatures that oozes out of people’s mouths when they unconsciously merge the words “yeah” and “but.” Kill them. Use their fur as a hat. Make them an endangered species. Here’s why: “But” is the most dangerous work in the English language. It puts people on the defensive. It makes them think there’s a catch. It negates everything said before. And it reduces the positivity of an argument. Fortunately, I wrote a list of twenty-one yabbit alternatives. You can read them at www.WascallyYabbit.com. Ultimately, phrases like these WIN because: They focus on solutions. They maintain positivity. They ASK instead of TELL. They foster creative thinking. And they encourage open dialogue. Study them today. Refer to them periodically. Use them often. Are you yabbiting? 8. Empathizing is highly overrated. In 2008, I met a guy named Cajun Dan. He’s a veteran grief counselor from Baton Rouge. After delivering a workshop to his association, I asked him to share (as a Professional Listener) what the biggest mistake was most people make in the listening process. He said, “The three most dangerous words any listener could ever say is ‘One time I…’” Lesson learned: Stop empathizing. Stop circling back to remind people how vastly experienced you are at their reality. Everything doesn’t always have to come back to you. Next time you’re in a group setting, try this: Instead of showing the speaker how deeply you feel his pain by interrupting his poignant story to share (yet another) selfish, inconsequential diatribe about the bowel movements of your three-legged Beagle, practice listening like a REAL leader – with your mouth closed. Good lord, man. Does this person need empathy or silence? 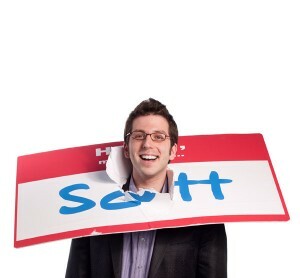 REMEMBER: In every group meeting, there’s always one putzbag. Don’t let it be you. Are you a meeting master? For the list called, “23 Ways to Bring More of Yourself to Any Situation,” send an email to me, and you win the list for free! Who’s telling their friends about YOU? Tune in to The Marketing Channel on NametagTV.com! Watch video lessons on spreading the word!